The amazonian basin is a very important area for Ecuador since it produces 500,000 barrels of oil per day which is the main source of income for our economy. Unfortunately only 63% of this oil is produced by state owned companies, and the 37% left is still fattening the profits of other companies that are not a direct benefit to our economy. This money pumping basin is also a very important area for ecotourism which benefits our economy. Unfortunately there are also foreign own businesses that profit form the biodiversity of our lowlands. In order to benefit our local economy I planned a trip to visit the Sani Lodge which is owned and operated by the local Kitchua community of Sani. The community of Sani has experienced the life changing forces of ecoturism and now are totally focused on forest conservation, customer satisfaction, health and education for their children. The main attraction to their lodge is the biodiversity of the region, and they are blessed with plenty of it! Their forest neighbors to the north the Cuyabeno Wildlife Reserve with 1,500,000 acres. Most importantly their forest is touching the Yasuni National Park to the south with 2,400,000 ares which is the most biodiverse reserve in the western hemisphere. Its biodiversity is so important that it has been declared a Biosphere by UNESCO, and the Ecuadorian Government is now trying to prevent the exploration of oil in this region with financial support of the international community (Yasuni-ITT ) in exchange for saving this forest. Birdwatching Sani Lodge begins before you arrive to the lodge. The only access to these remotes areas is via the Napo River which in itself is worth a few days of exploration to discover the avifauna near the shores and islands which have a few range restricted and endemics like the Olive-spotted Humingbird. A visit to their new, impressive, observation tower is an amazing experience that yields some great looks at birds like the Bare-necked Fruitcrow, White-throated Toucan, and many other. The lake around the lodge provides the perfect home for birds like the Sungrebe and the Agami Heron. The trails are very productive for antbirds and other ground birds like the Chestnut-belted Gnateater and Scaled-backed Antbird. Some of the trails lead into vareza forest where a few range restricted birds like the American Pygmy Kingfisher and the Gray-headed Tanager can be found. The lodge is in the middle of a primary forest and is visited regularly by many birds. We got our first looks at Scarlet Macaws, Orange-winged Amazons, Long-billed Woodcreeper, and at night we found the Tropical Screech Owl next to the dining room. A visit to the community area also bumped our bird count with spectacular birds like the Great Potoo and the amazing Rufous-headed Woodpecker. Last but not least our birding guide Carlos Gualinga, from the community of Sani, was very knowledgeable, professional, friendly, and reliable. I recommend him to anyone who wants to visit Sani Lodge. 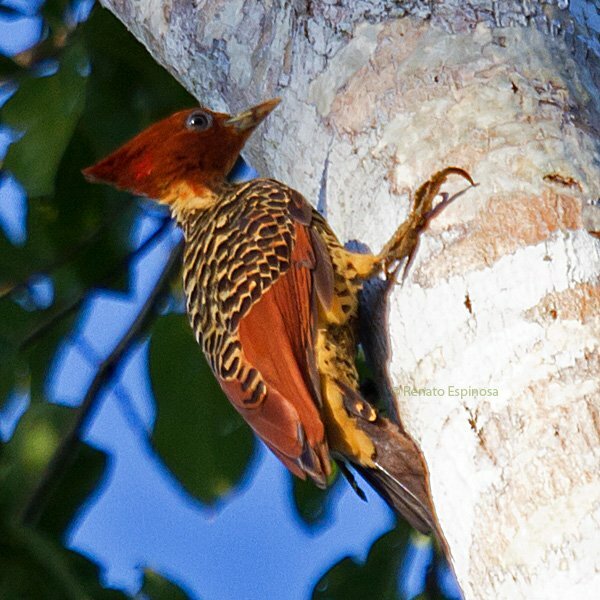 Great post and images of Amazonian birds! Wonderful, I especially like the image of the owl with a scowl. I have great memories of my trip down the Napo to La Selva lodge one New Years day. Well not so much of the trip, as I had a bug and had to spend all my concentration on keeping my insides inside. But the visit to the Ecuadorian Amazon was magical, and will remain a high point in my life. Clare, I hope you come back to Ecuador again! I agree with you it is 100% magical. Wow, this is one of the most impressive lineups of birds I’ve ever seen, even for Ecuador! I know where I want to go next time I visit. Still waiting for your 2nd visit Mike. Where Are You Birding This First Weekend of March 2016?